Click Here to Ask An Expert Do you have some questions that you would like to ask a professional refrigerator repairman? If you have water build-up on the floor of the food compartment, or ice buildup on the floor of the freezer compartment, you are probably suffering from either a frost problem (see section 4-4) or from a clogged defrost drain. There are a few exceptions described in section 7-7. Directly beneath the evaporator will be a water collection pan with a drain hole. Leading from that drain hole to the drain pan beneath your refrigerator is a drain tube. 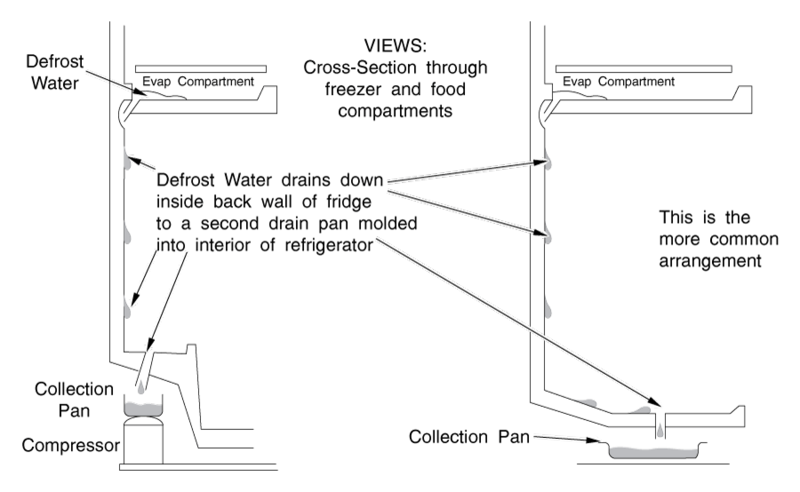 Top-freezer models usually drain through a drain tube out the back of the refrigerator and down to the drain pan beneath the fridge (Figure 39). Some top-freezer models have a removable drain tube or trough inside the food compartment. Some refrigerators, especially older models, may have different defrost drain arrangements. Some top-freezer models drain the defrost water to the inside back wall of the food compartment. The water runs down the back wall to another drain hole which leads outside the fridge to a drain pan. (Figure 40). 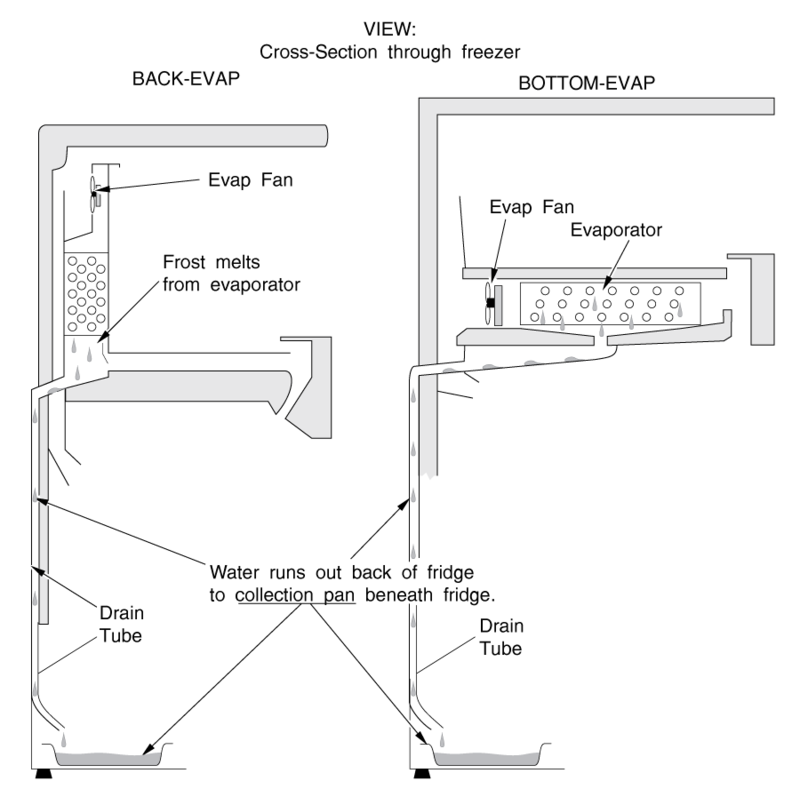 On back-evap models, if the drain backs up, it will not freeze the evaporator. You will see the collection pan full and frozen over. 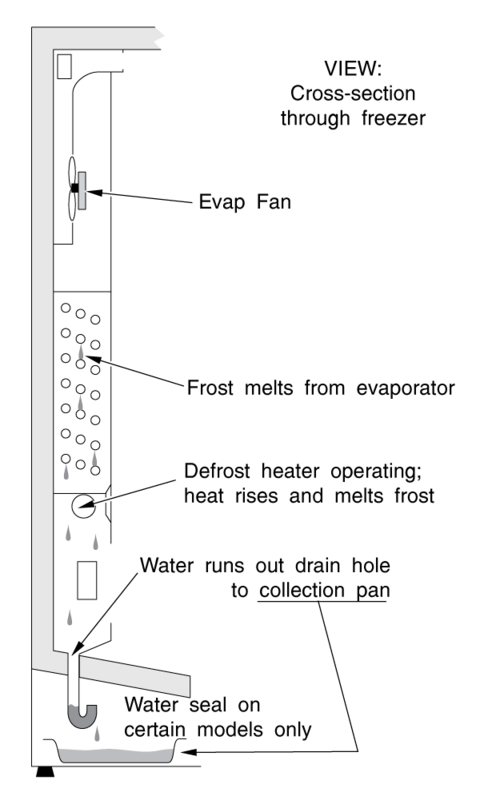 On bottom-evap models, the evaporator will be frozen into one solid block of ice. In either case, when the collection pan fills up with ice, the defrost water will generally start showing up on the inside floor of your fridge; either as water in a top freezer model or as a thick ice accretion in a side-by-side. The water may leak out onto your kitchen floor, or it may freeze up drawers within the freezer compartment. In a top-freezer model, you will probably also see ice or drippy water on the roof of the food compartment. Bottom-evap models are a little more difficult. The full collection pan will have frozen the evaporator into a solid block of ice, (Figure 42) which will be a bit more difficult and time-consuming to melt. You must melt it thoroughly. Some models have the drain hole located at the very back of the compartment instead of directly beneath the evaporator. Check there first. 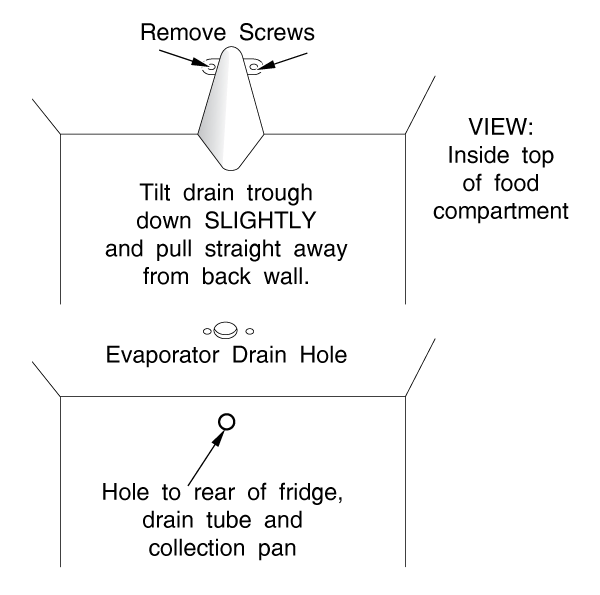 If the drain hole is not visible, you will need to lift the evaporator as described in Section 4-5(d) to access the drain hole. 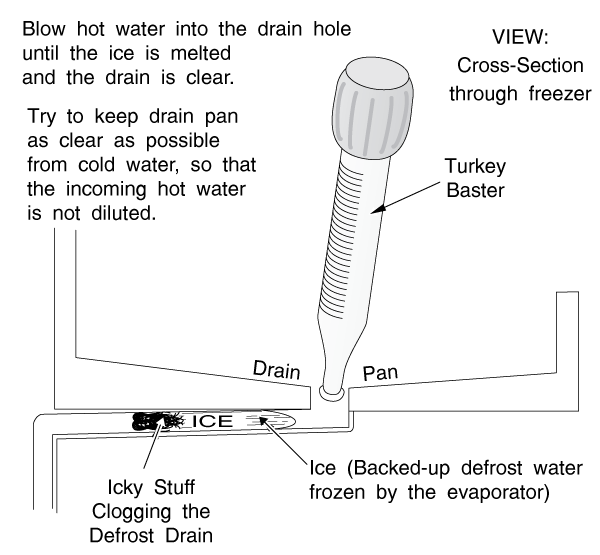 As you go along, keep sucking out the excess water (now cold from melting ice) with your turkey baster and put it into an empty pot. This will prevent it from diluting the incoming hot water. It will also prevent it from ending up on your kitchen floor. Continue blowing hot water into the drain hole until you hear it running into the collection pan beneath your fridge. Give it a few extra blasts of hot water to make sure you get all the ice. Using your turkey baster, empty this collection pan now and then. It will prevent the pan from overflowing onto the floor. If it is too inconvenient or messy to do so, don't worry about it. The water will evaporate eventually. Some models actually have small heaters attached to the underside of the drain pan. The heater prevents the defrost water from re-freezing and clogging the defrost drain hole when it hits the cold defrost drain pan. If the heater is not working properly, it may have the same effect as a clogged defrost drain, a buildup of ice. This arrangement is generally used on back-evap fridges (top freezer or side-by-side) where the defrost heater may not be mounted close enough to the drain pan to prevent it from refreezing the drainage. These drain pan heaters are a much lower wattage than the defrost heater and run a bit cooler; when operating, they will feel warm to the touch. If you have a back-evap model, check the defrost drain pan for a heater. To find it, look for its two power leads. If there is a heater, check it for continuity and replace it if it is bad. They are usually held to the pan by spot-welded tubes or clamping plates, or by super-sticky aluminum tape. 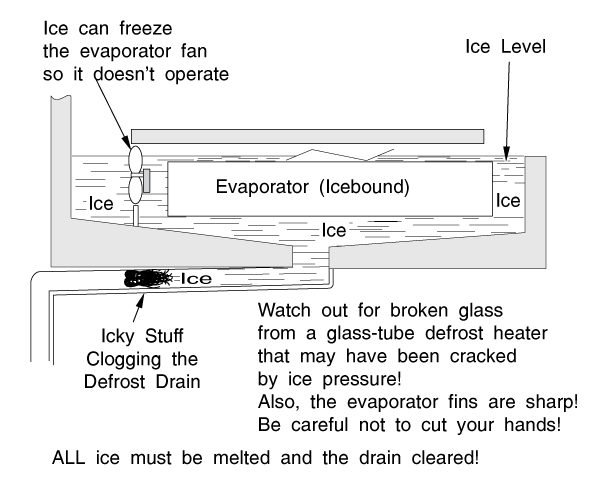 Please share our information about when a refrigerator has ice or water buildup.